How Axium Healthcare Pharmacy Grew from 50M to 500M and Became an Attractive Acquisition Target for The Kroger Co. Specialty Pharmacy Builds National Brand Equity Across the U.S. This pharmacy was experiencing growing pains due to the specialty pharmacy industry’s rapid rate of growth. With inconsistent marketing tactics that lacked a unified voice and direction, the company was unable to break through the noise and prove why they were not only different, but the better alternative for quality specialty pharmacy services. It was clear to the leadership team that the industry was on a long and fast-paced trajectory, with massive opportunity for growth. In order to standout from the crowd, the client needed a full-service marketing team with strategic, tactical, and clinical know-how. 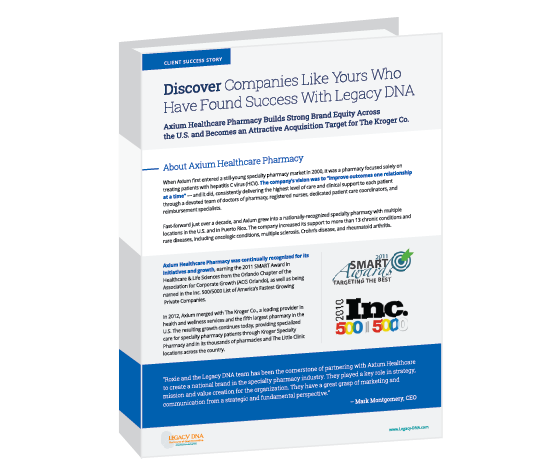 That’s when they reached out to engage the team of healthcare marketing experts at Legacy DNA.